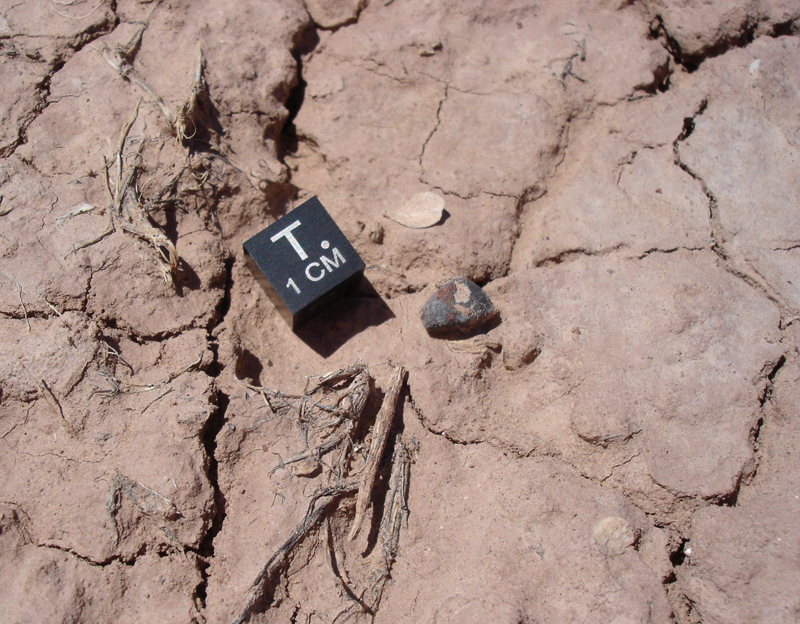 100 years ago, just after 7 o'clock on the evening of July 19, a large rock from somewhere between Mars and Jupiter passed through our atmosphere and exploded over the Arizona desert, showering the ground with small black rocks. Since then countless people have pulled many, many kilograms of these same black rocks out of the sandy soil where seasonal ice, rains, and wind take turns burying and uncovering them as the decades roll by. 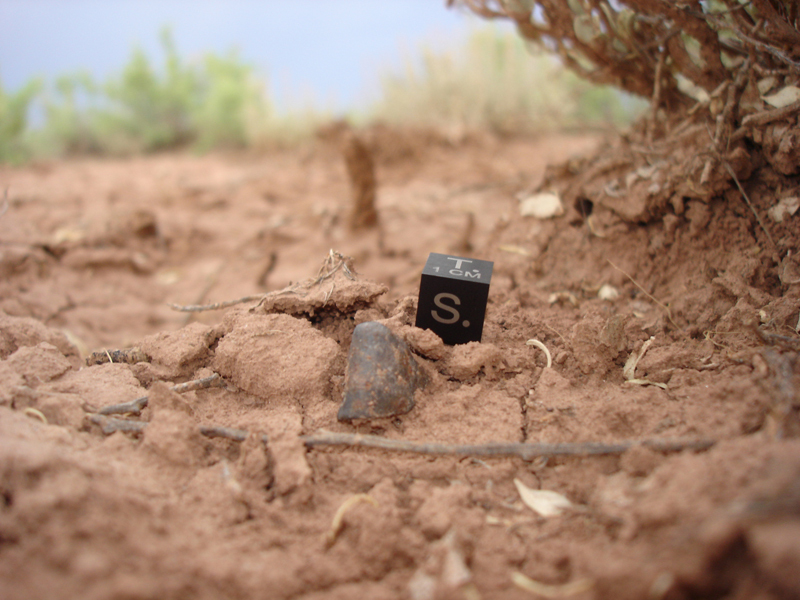 Several meteorite enthusiasts from across the southwest got together to celebrate the centennial of this fall. After all the success and good times had at last year's hunt many of us had been looking forward to this trip for several months. I hit the road early Friday morning, and by lunch time I was at Franconia. 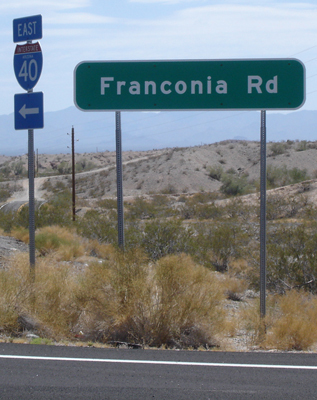 Franconia is almost the half-way spot for my drive (maybe it's the 3/8ths spot, or the 4/9ths...) and I had planned to eat lunch there and spend an hour or two stretching my legs and swinging my detector. Who knows, maybe I'd get lucky and find a Franconia chondrite to start the trip off? 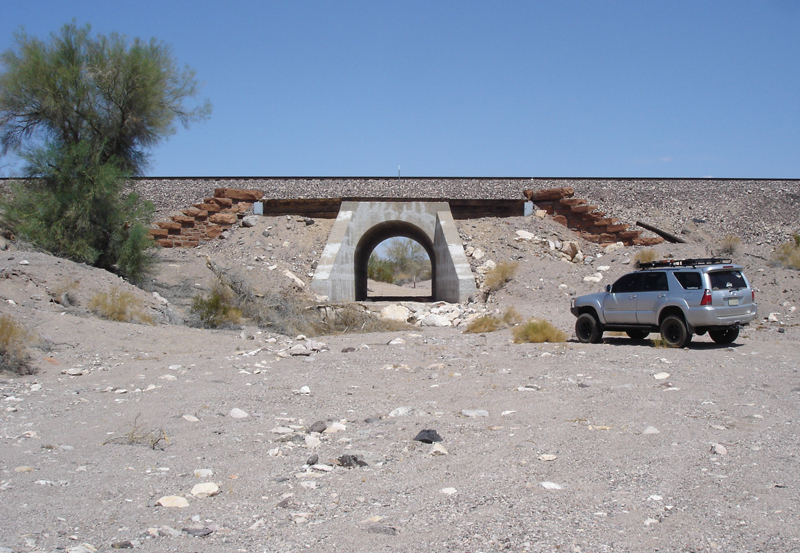 I parked at the tunnel and ate lunch inside my truck with the AC cranked; it was 110*F outside. I met a nice jack rabbit trying to stay cool inside the tunnel. He was there again when I left 2 hours later, so I dropped off a handful of carrots as payment for being bothered in the heat. My only find in the short distance I covered was a single 1" long strand of steel cable about the diameter of a hair. After an evening poolside in Holbrook with several other meteorite hunters I woke up early and headed out to the strewn field to watch the sun come up. Last year I found one 0.5g stone, so I set a goal for myself this trip to double that and find at least 1 gram; I thought that was a reasonable goal. By mid-morning everyone had arrived and were out hunting. I heard calls on the radio soon after as people were making finds. This got me to thinking about an account written at the end of 1912 which I had recently come across that said something to the effect that "all the meteorites in the strewn field have pretty much been found". 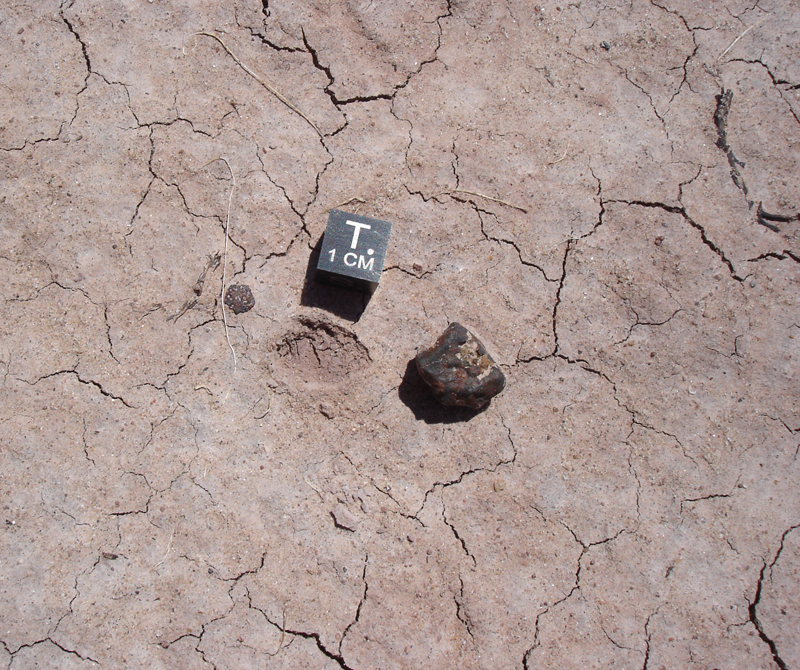 I have a feeling that in another 100 years people will still be finding meteorites out there. Around 11am I came across my first find. I was heading toward some dunes across an open hard-pan area (which I had no intentions of hunting) and there it was, right in front of me. I dropped down to my knees and was so excited that I picked it up before getting a picture. Right next to it was a small fragment of its fusion crust that fit onto the bottom of the stone, how cool! My first find of the trip, and it came with a bonus piece. I put the rock down next to its hole and snapped a photo. This little guy is covered in regmaglypts. 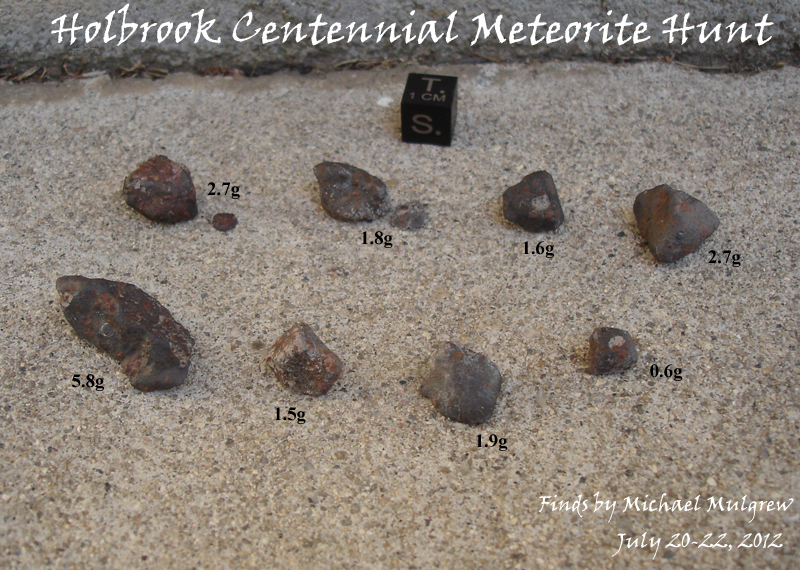 Holbrook meteorites have so much character in such a small package. Find #1, 2.7g. 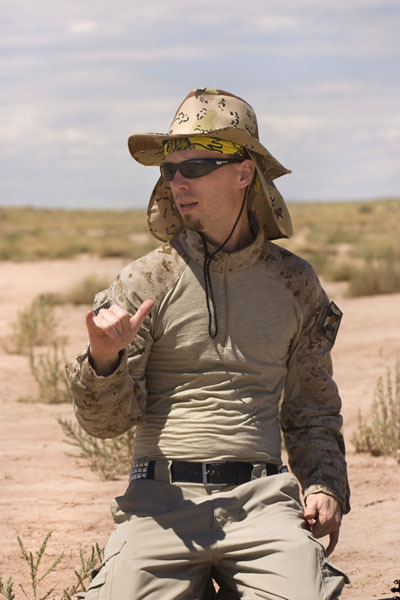 My friend (and one of the most successful meteorite hunters at Holbrook in recent history) Erik Fisler came over and snapped a picture while I was doing the happy shaka dance after I found the meteorite. I hunted for another couple hours and then drove back to the hotel for a lunch break. I was so stoked that I had met my goal and got a nice find that I didn't mind leaving the strewn field for a bit. 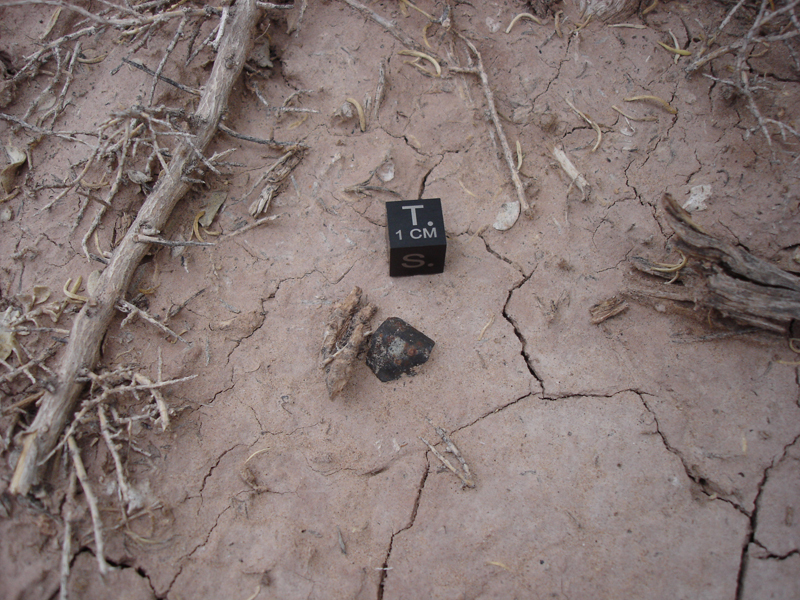 I ate my lunch, relaxed my eyes for a few, and then drove back to look for another meteorite. If I could find two meteorites in a single day my mind would be blown. As I hiked back into the strewn field monsoons filled the horizon and lightning arced down to the ground in the distance. 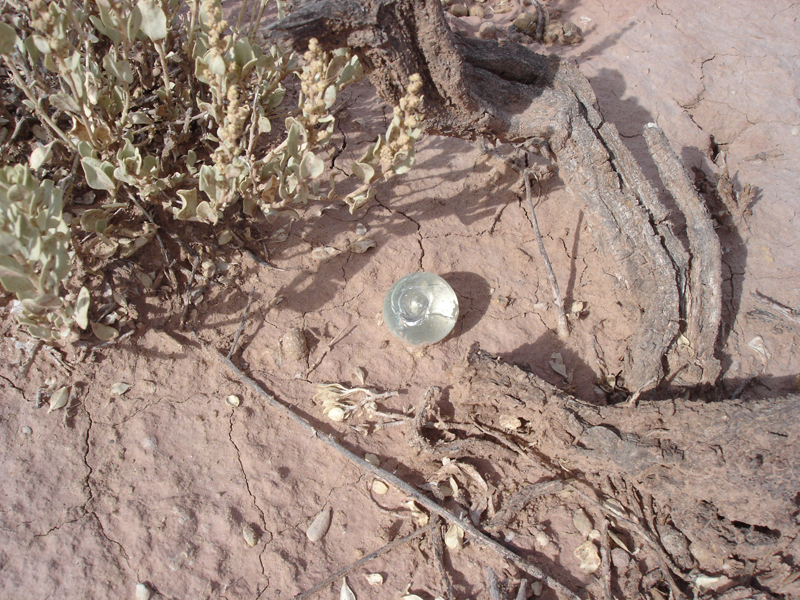 I passed by a shrub and looked over my shoulder and saw one of the mysterious Holbrook marbles resting there in the evening sun. I took this as a good omen. A short while later I made my second find. I couldn't believe it, two finds in one day! While I was waving my arms over my head like a crazy person I reminded myself not to pick this one up until I took a picture. I got down on my knees to look at it more closely and noticed a second piece sitting right next to it. Wow! Not only two finds in a day, but both of them have two pieces. 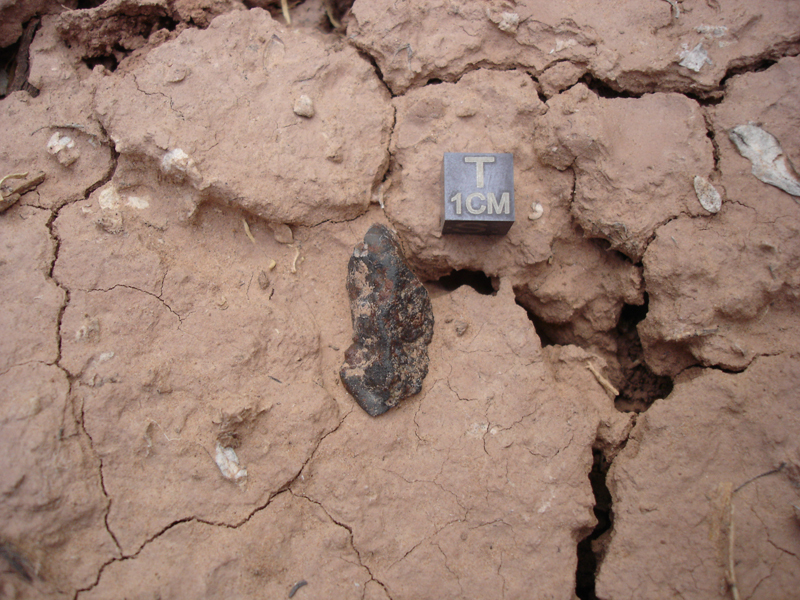 Unlike the first find, the piece that broke of this one is more than just fusion crust. It fit perfectly into a spot on the side adjacent to where it was laying to make one complete stone. Find #2, 1.8g. It's only a flesh wound. Find #2 claws its way out of the soil. I think the partial cloud cover that had shown up as a result of the neighboring rain squalls resulted in lighting that was ideal for making the rusty black Holbrook meteorites stand out. After eddying around several more bushes I scored my third find. Unbelievable! The fusion crust had eroded off the bottom of this one, exposing the grey interior, but the top was nice and black with several small regmaglypts. Find #3, 1.6g. It was like these things were falling out of the sky! The next one I found was cone shaped with secondary fusion crust on the bottom. Find #4, 2.7g. Literally 5 minutes later I found my biggest meteorite. As it sits in the picture below the area to the right of the vertical ridge is complete secondary fusion crust, while the area to the left of the ridge is regmaglypted primary fusion crust. 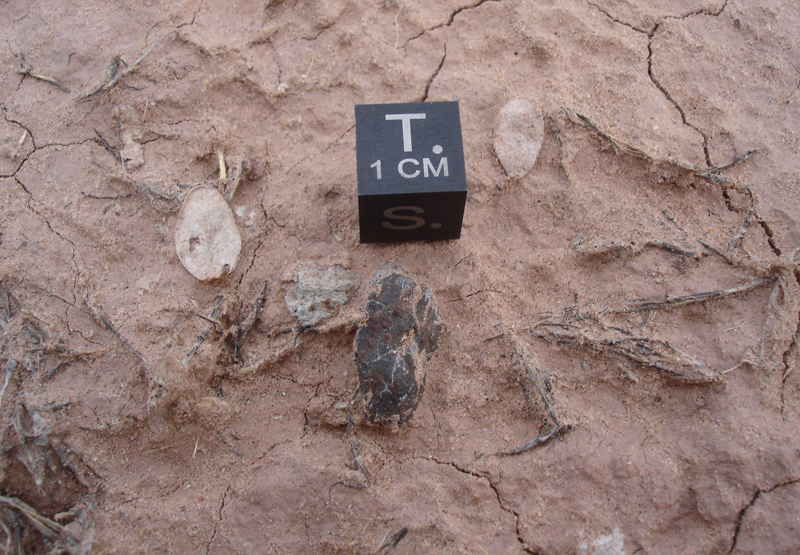 The fusion crust had eroded off the bottom of the stone revealing several chondrules, the largest having a diameter of 2mm. Find #5, 5.8g. One of the nice things about hunting Holbrook is that there are hardly any rocks at all, so anything that's not the native soil is worth looking at. 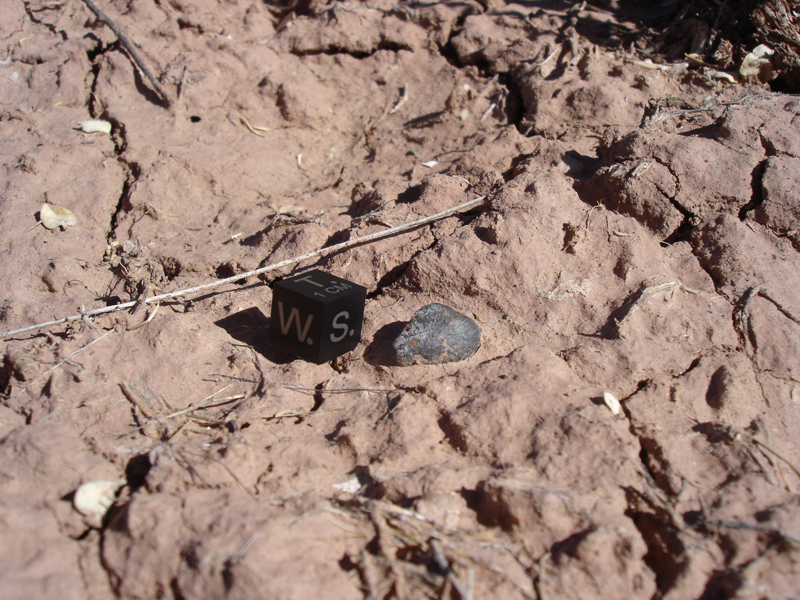 I had been poking just about everything that didn't obviously appear to be a meteorite with my magnet pole all day, and just so happened to stab it at what I thought was a tiny black rock sitting on the dirt. 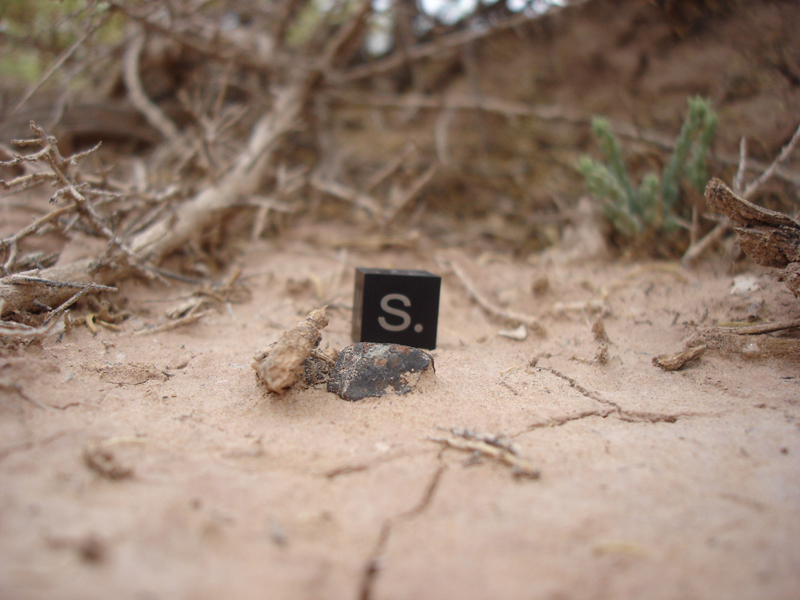 The metal tip of my magnet pole smashed through the top crust of the dirt and the magnet came out of the ground with a meteorite stuck to it! I just found a meteorite by accident, I couldn't believe my luck. This one was 100% fusion crusted, although a bit rusty in spots. 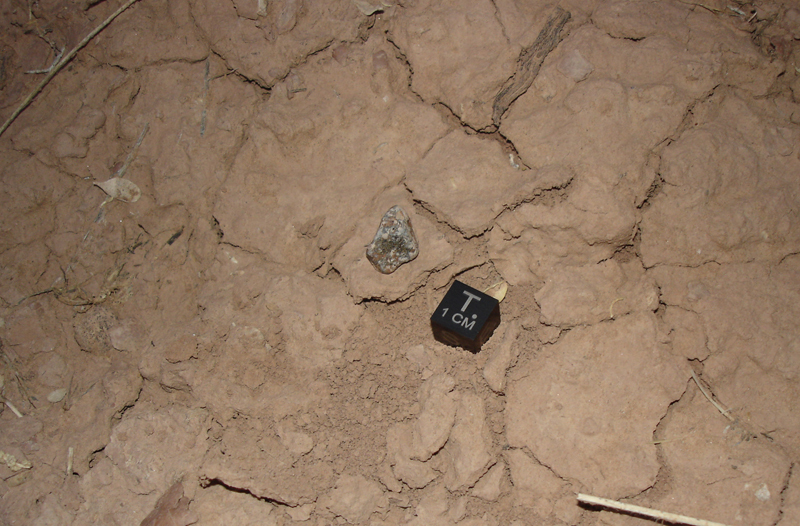 The scale cube in the photo below is resting where the meteorite was buried. Find #6, 1.5g. My 7th find is what I think is the coolest of them all. It's an oriented shield with radial flow lines, partial roll-over lipping, and one side edge of black secondary fusion crust. The flat back side has several small regmaglypts. 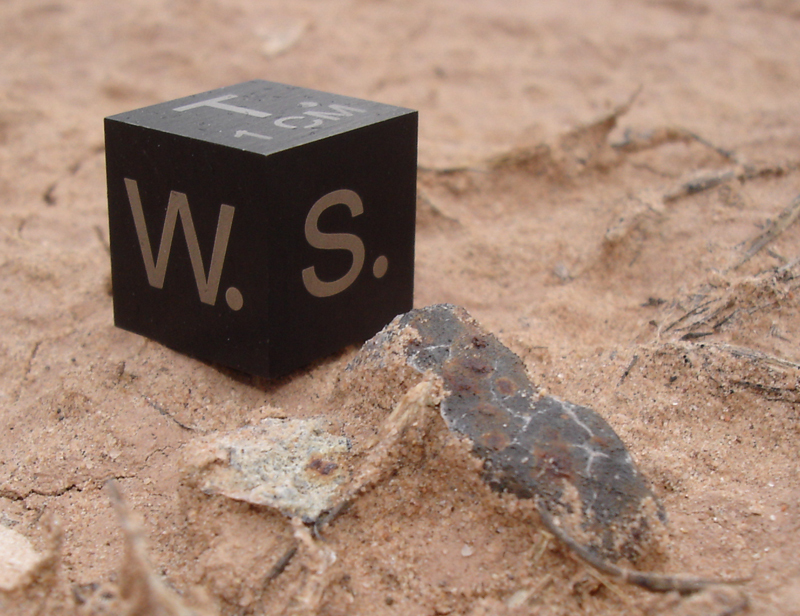 This little rock has about every cool feature a meteorite can have. Find #7, 1.9g. My final find of the trip was also the smallest. Even this little guy showed off some features with a side covered in secondary fusion crust. Find #8, 0.6g. Here are my finds after I got home and cleaned them up. They are in the order I found them from left to right, top to bottom. On my way home Sunday I stopped at Meteor Crater to visit their museum and see the crater again. The admission price had gone up $1 since last year, but the place was still packed. Afterward I drove out to Canyon Diablo, the namesake for the meteorites that came from the crater forming impact 50,000 years ago. 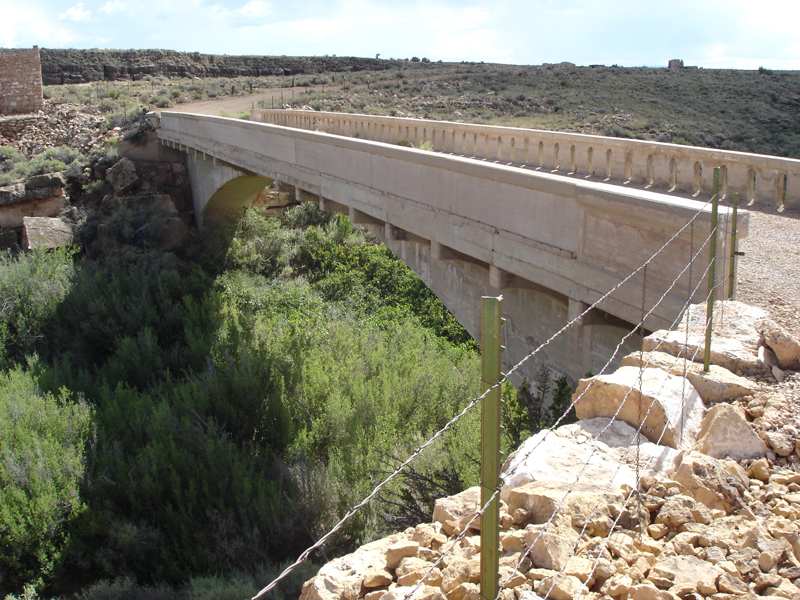 The picture below shows the bridge for the eastbound crossing of I-40 over the canyon. 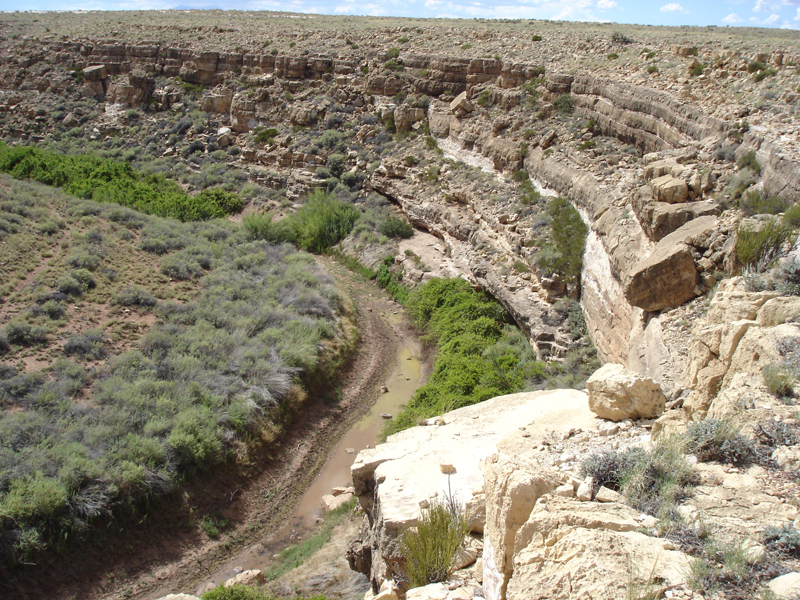 Different layers of rock are displayed nicely on the canyon walls. The ghost town of Two Guns was on the other side of the interstate, so I drove over to check it out. 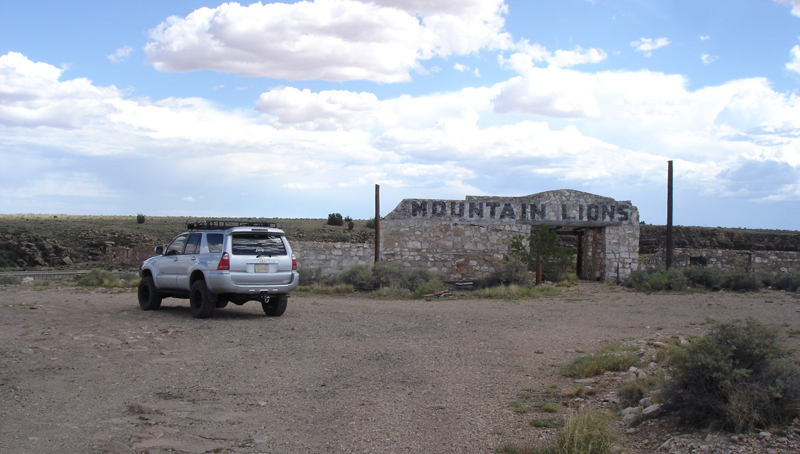 Two Guns has quite a history, from indian battles to a Route 66 tourist trap. There are stone ruins of old building spread all over the place. Better check it out before they put a gate around it "for your safety". 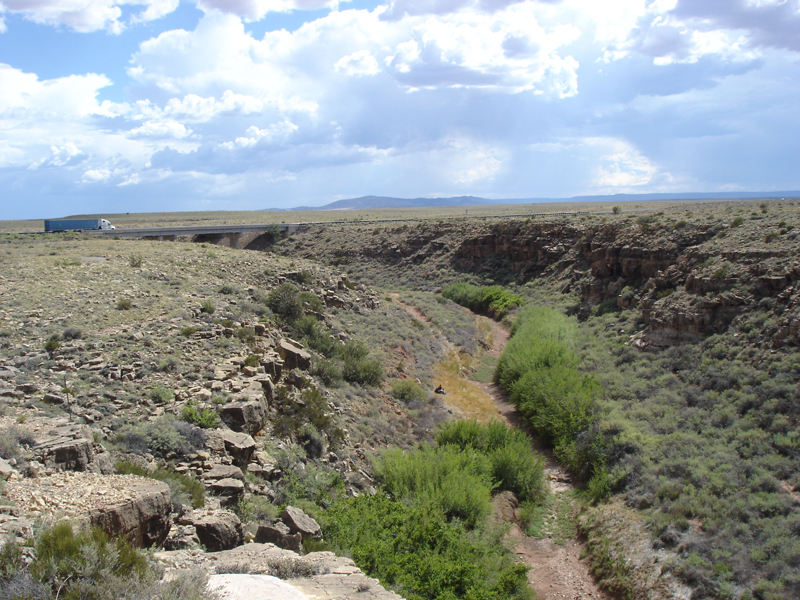 The old Route 66 bridge across Canyon Diablo. This was be best way across the canyon for a very long time. Did someone say 101st anniversary hunt?